THE NUMBER ONE SUNDAY TIMES BESTSELLERWINNER OF THE COSTA NOVEL AWARD 2018WINNER OF THE AN POST IRISH BOOK AWARDS NOVEL OF THE YEARWINNER OF THE SPECSAVERS NATIONAL BOOK AWARDS INTERNATIONAL AUTHOR OF THE YEARSHORTLISTED FOR THE IRISH NOVEL OF THE YEAR AWARD 2019LONGLISTED FOR THE MAN BOOKER PRIZE 2018LONGLISTED FOR THE WOMEN'S PRIZE FOR FICTION 2019LONGLISTED FOR THE RATHBONES FOLIO PRIZE 2019Connell and Marianne grow up in the same small town in the west of Ireland, but the similarities end there. In school, Connell is popular and well-liked, while Marianne is a loner. But when the two strike up a conversation - awkward but electrifying - something life-changing begins. 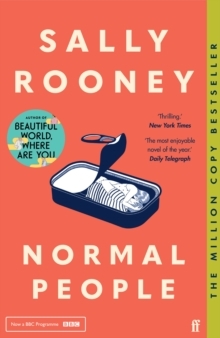 Normal People is a story of mutual fascination, friendship and love. It takes us from that first conversation to the years beyond, in the company of two people who try to stay apart but find they can't.